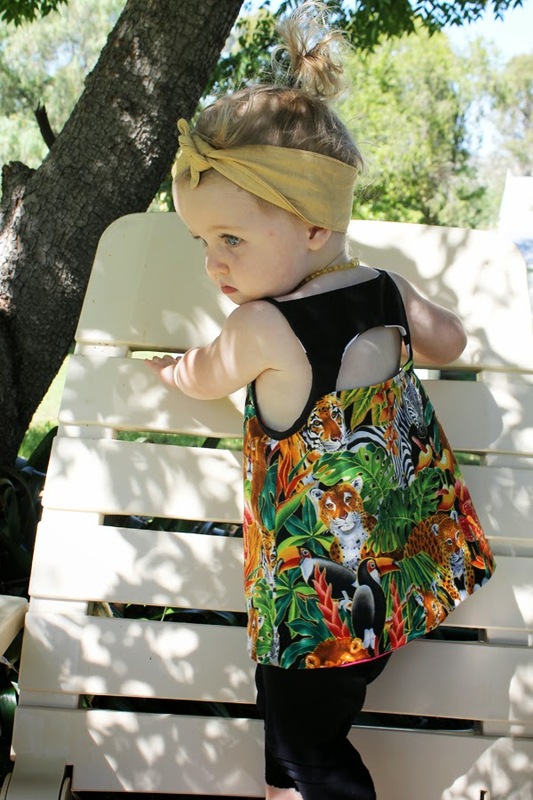 A little while ago I was able to do some testing for EmmylouBeeDoo's newest pattern in the works: The Shandiin Tunic & Tank! I made two, but this one was the only one I managed to get nice-ish photos of. Unfortunately it's starting to get cold here in Australia so either I get my Shandiin fix by making them a size larger for Eddie to work it in December, or I just wait until it does get warmer! The Shandiin Tunic & Tank is a cute little pattern in several lengths and with several features including a button front or an elasticated waist. I'm really excited for this pattern to be released to see what you guys come up with! The customising options are endless and I've seen some really inspirational ideas already for it. 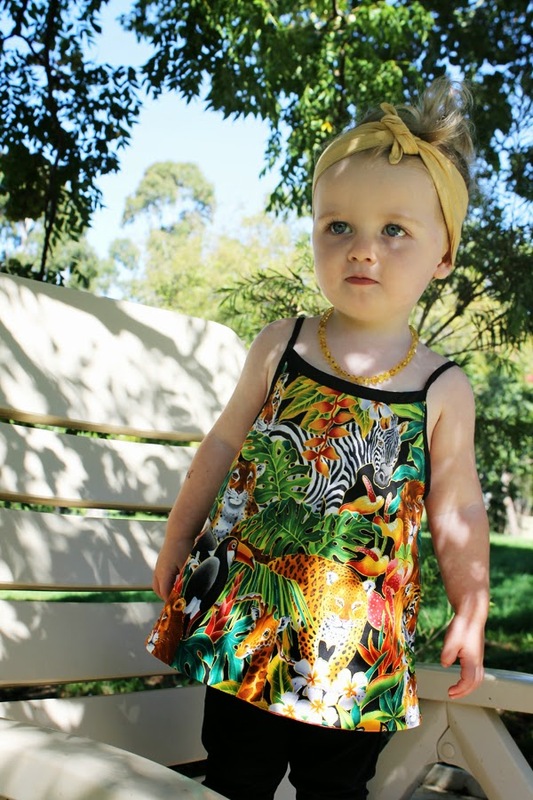 The little jungle girl one I made is made from Robert Kaufman fabric. Honestly I'm not a big fabric snob, I don't name-drop fabric designers because A: I don't know that many and B: most of my fabrics are thrifted and also C: I don't really care a lot ;) HOWEVER in saying that I am a fan of Robert Kaufman prints, they're totally up my alley! I've made Vincent a pair of simple pull-on shorts made from this fabric which are pretty fun and I loved using up the rest of it for this tunic! 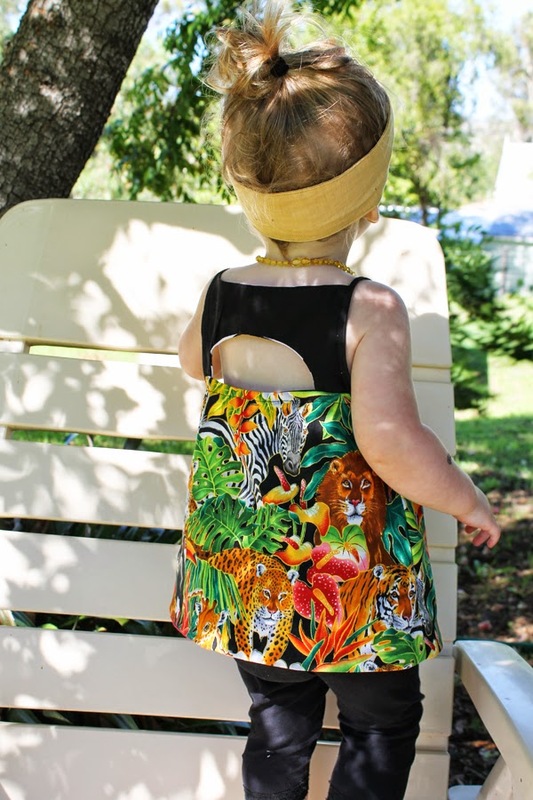 The peek-a-boo back is probably the cutest part of this tunic, I just love baby backs and I love the shapes and the style and just everything about this pattern! It's surprisingly very simple to sew, don't be intimidated by it! This pattern is about to drop REALLY SOON. It's actually quite simple to sew up, and very quick to make (like all of LouBeeClothing's patterns really!). Keep an eye on Sarah's blog or facebook page to get the news when it's out! Super cute. My son has started asking me to make him clothes again after our going through his baby stuff I made for him, so I really need to browse your archives again to get more suggestions (and to find that cute legging pattern for myself). This is so adorable. Also, I can't believe how big Eddie looks already! A-Dorable! As usual!!!! Eddie looks so sweet in her Shandiin! !